The Preschool Summer Literacy Camp is especially designed for children who are ready for intensive reading and spelling activities. 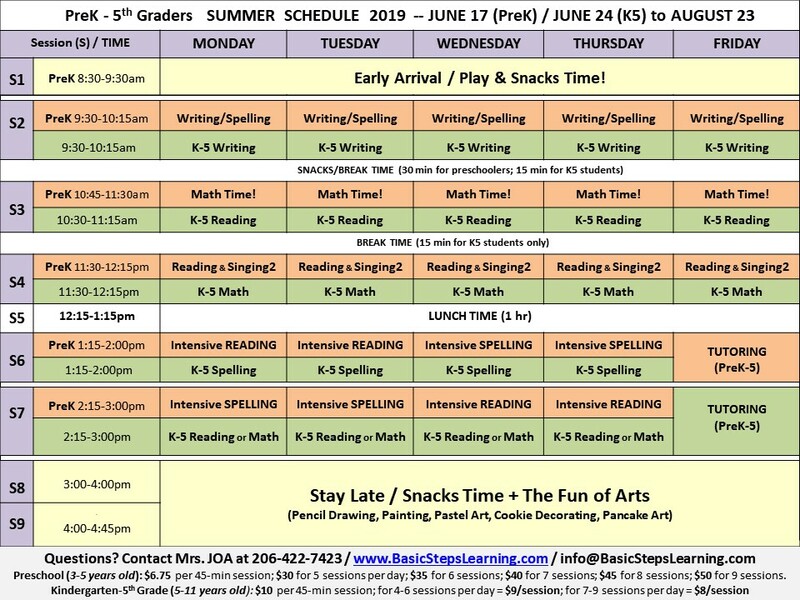 The schedule (from 8:30am to 2:55pm) we designed for the summer will help PreK children (who are going to kindergarten this coming fall) get used to the long schedule they will experience in their first year at a public/private school. The intensive reading class and spelling/writing class will help our PreK students build a solid foundation in reading sentences from left to right, sounding out letters, and correctly spell consonant-vowel-consonant (CVC) words. We have been running our literacy camp for over 5 years! With our experience and rich learning materials, your child will definitely develop the early tools they need for excelling in elementary school!! Sign up TODAY for our 10-week literacy program that will give your child the paramount skills to kindergarten success!!! In our intensive reading class, children will practice reading pronouns, verbs, and high-frequency sight words such as “of,” “can,” “see, “the,” “it,” etc. Children will also learn to read sentences from left to right and develop an understanding of how words are put together. Most importantly, they will recognize how capital letters, lowercase and spacing between words are used in a sentence! In our intensive spelling/writing class, children will practice writing and spelling out CVC (consonant-vowel-consonant) words such as MAT, MAD, MAN, etc. We will have engaging activities for children to learn and have fun at the same time. After this summer class, your child will sure love spelling out words!!! These classes are only offered in the summer. Children who are at least 3.5 years old can register for these afternoon intensive classes. Children who are ready for these intensive classes can sound out letters and are able to follow instructions in a 45-min class. Parents can choose as few as one session per week or as many sessions as needed. Tuition for the summer quarter will vary depending on how many sessions per week you register for your child. Please click here to find out more about our tuition rate. We prorate your tuition. If there is a holiday, we automatically deduct it from your total tuition. If a vacation is planned in advance (and the dates are notified by the deadline), we will deduct those days your child is not attending as well. Children who go through our summer program and will be attending kindergarten this fall are eligible to take graduation pictures with their classmates! Fun! The dates are scheduled on our summer calendar.